Have you noticed your lips or hands being drier than normal? If so, it's because the air over North Texas has been quite dry the past couple of days. Meteorologists use the dew point temperature as a way to measure how dry or moist the atmosphere is. The dew point is the temperature the air would be if the atmosphere was saturated. The lower the dew point, the drier the air. The higher the dew point is, the more muggy the air feels. Most people find a dew point temperature in the 55-to-60 degree range to be comfortable. Anything above 65 degrees and the air begins to feel more humid. It's really sultry when the dew point climbs above 70 degrees. On the contrary, a dew point below 30 degrees is considered dry. That's when we notice our skin becoming dry and cracked. Much of this week we've had low dew point temperatures ranging from the teens to the 30s. 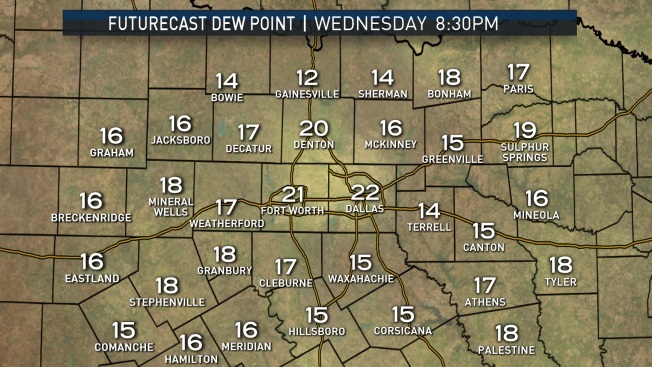 The map above represents Wednesday evening's dew point temperatures. 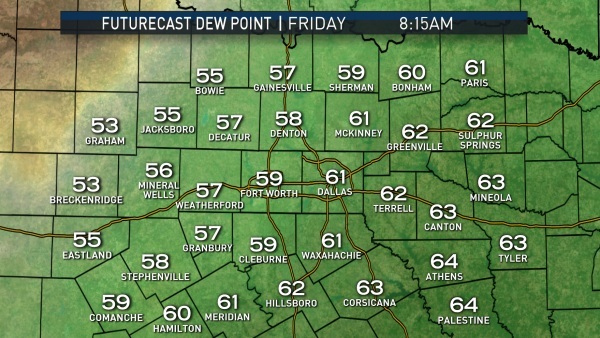 We will have an increase in dew points into the 50s and 60s by Friday morning. This means our atmosphere will become more moist. The increase in the dew point temperatures will help support a chance of spotty showers and thunderstorms this weekend in North Texas.